Bill reviews the Yamaha MX88! Our keyboard specialist, Bill Blackwelder, reviews one of his favorite boards! Yamaha never ceases to grace the humble keyboard community with workhorse instruments; whether it’s a vintage 200 pound, all analog CS-80, or a Reface DX, the folks at Yamaha definitely know what they’re doing! With that being said, one instrument in particular that has really grabbed my attention is the Yamaha MX88 synthesizer. Since it’s debut roughly a year ago, this board has proven its role as a major contender in the higher end keyboard market. At first glance one could very easily be put off by the board’s sparse and scaled down user interface; this no frills front panel is very reminiscent of the MOTIF/MOXF (sorry, still no faders here) front panels. The simplicity of MX88’s user interface means less distraction with menus, dials, and buttons and more focus on what matters: your music! If you’re well seasoned with this setup of user interface, you’ll be right at home and can dig right in! In theory, the MX88 is a more portable and more stage friendly version of the venerable MOXF8/6 workstations. Like its big brothers, MX88 can be thought of, for lack of a better term, as a ROMpler. The high quality sounds inside the instrument are based on sampled waveforms of real acoustic instruments, vintage synthesizers, etc. or are actual samples of these instruments themselves. These waveforms and samples are saved in the form of PCM samples that can be edited, stored, and replayed from permanent Read Only Memory. This sampling technology is what lends itself to the MX88’s astonishingly realistic voices and performances. In fact, all of the voices in the instrument are based on the legendary MOTIF soundset, so yes the ever trusty MOTIF acoustic piano patch is on board. I could go on for days about the sounds offered in the MX88; they are phenomenal! The woodwind voices in particular are of desirable quality. The main advantage of this is the opportunity to create incredibly realistic layered sounds by using the MX88’s voices in conjunction with their acoustic counterparts. An example of this would be recording yourself playing a riff on an alto saxophone in your mix and then replicating that line with the alto or even tenor saxophone voice in the MX88. The synthetic quality of the saxophone sample paired with your acoustic sax opens up a whole other world of realistic sound combinations! This technique will instantly add more depth and resonance to your mix. Aside from sounding great, the MX88 has some truly indispensable features that cannot be overlooked. The most useful of these is the fully programmable arpeggiator. This function can be completely synced via MIDI and can really be a springboard to your compositions. No one will ever know that the sickening sixty-fourth note violin run was totally programmed and not played by you by hand! Other standard features include sustain pedal connectivity as well as expression pedal connectivity for total volume control right on the floor. I recommend Yamaha’s FC7 expression pedal. It’s built like a tank and will hold up for years to come. 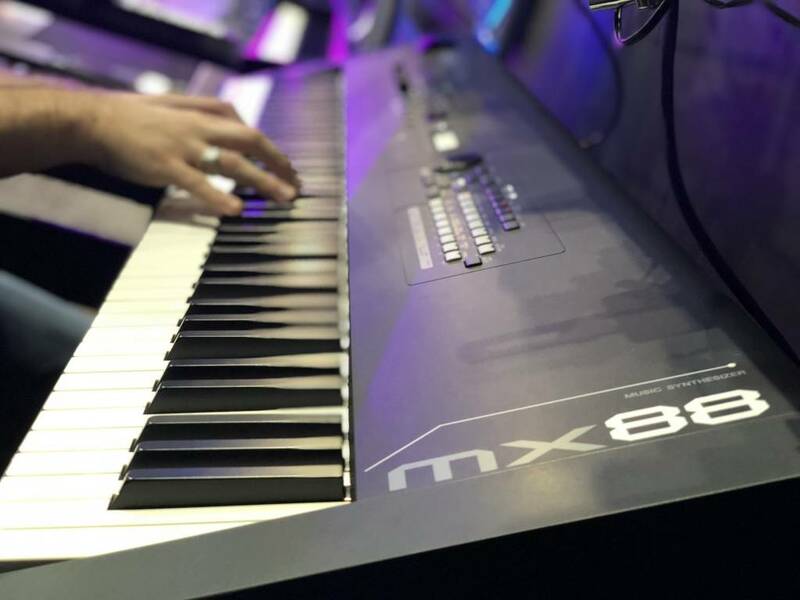 If this all weren’t enough, the MX88 is fully compatible with Cubase and a lite version is included with the purchase of the board so you can be off the ground and recording in no time. The instrument also functions as a great weighted 88 key MIDI controller for controlling soft synths in Cubase or an entire MIDI hardware setup controlling synths, samplers, drum machines, and more! All in all I really love this board and am amazed with its versatility in almost all musical situations. Great sounds, great MIDI control and seamless integration with any DAW make it an all around great choice for any keyboardist wanting to take their music to the next level!